I got the pictures taken, but my involvement with multiple local commitments meant my Bloom Day post didn't happen until now. And although many of these flowers aren't out there now (after several sub-freezing nights since I took the pictures) they were lovely on November 15th. For the record, here they are! This little Rhododendron 'Shamrock' surprised me with a few out of season blooms. They look almost white here but they are actually a very pale green. Fatsia japonica is doing its Sputnik thing. Punica granatum was blooming on November 15th, and it's blooming still, albeit with fewer leaves since our arctic cold snap. A last few blooms from Agastache 'Acapulco Orange', my summer heartthrob. And the last, slightly ratty blooms of Agastache 'Apricot Sprite'. What would a late autumn/early winter Bloom Day post be without Rosemary? I actually overlooked this prostrate Rosemary last month but it's still going strong even after our cold spell. These few last blossoms on Erigeron glaucus are just a memory this week. Not so with this Penstemon: I just checked, and today it looks about like it did last week. 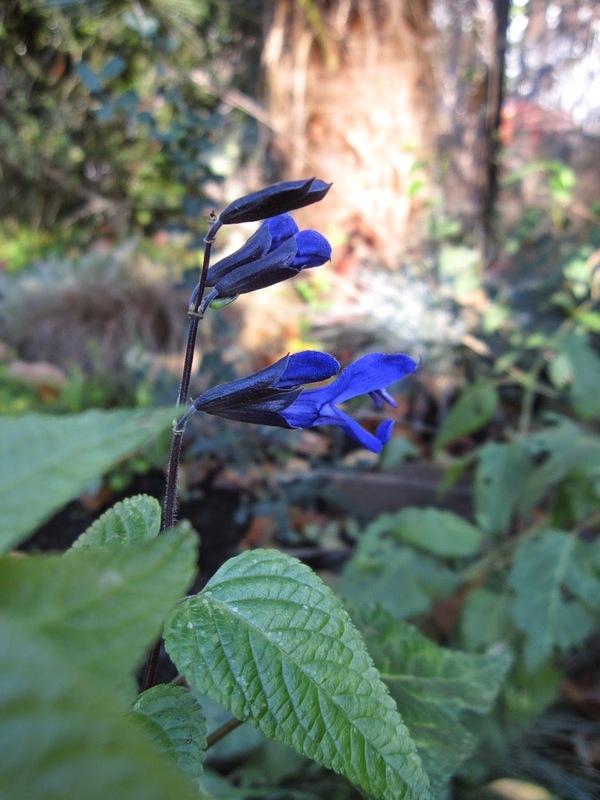 Salvia 'Black and Blue' surprised me by holding out this long - well, until last Saturday, anyway. I have a hard time capturing its color with my little point-and-shoot camera but this photo is pretty true. That blue is electric! Rosa 'Perl d'Or' lives in a protected container on the deck near the house. It's still blooming now, a week after I took these pictures. My last Bloom Day flowers are those of Camellia sasanqua 'Yuletide', ushering in the holiday period. 'Yuletide' lives up to its name both by blooming in December and by being a deep pink trending to a Christmas-y red. Bloom Day is hosted each moth by May Dreams Gardens. 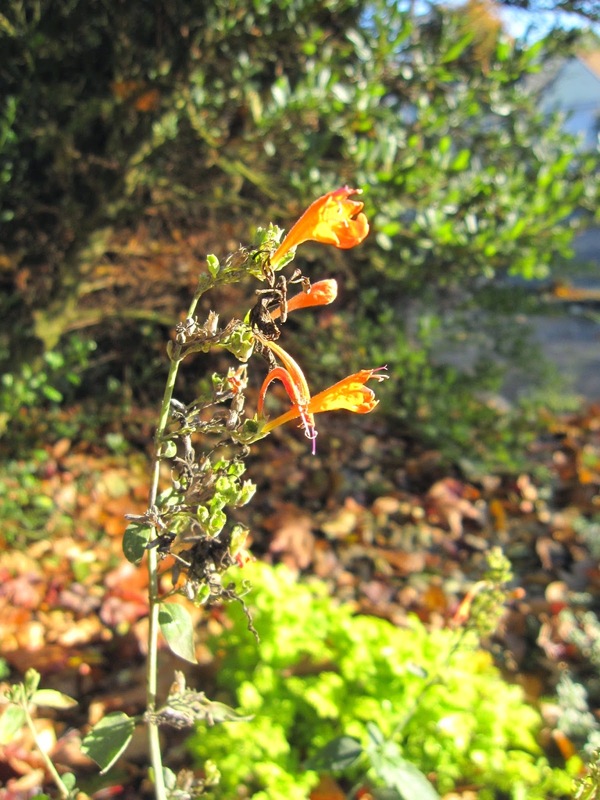 Click over to see what was blooming on November 15th everywhere! There's lots of autumn color out there this week and I've been enjoying all of it for the past few dry days. 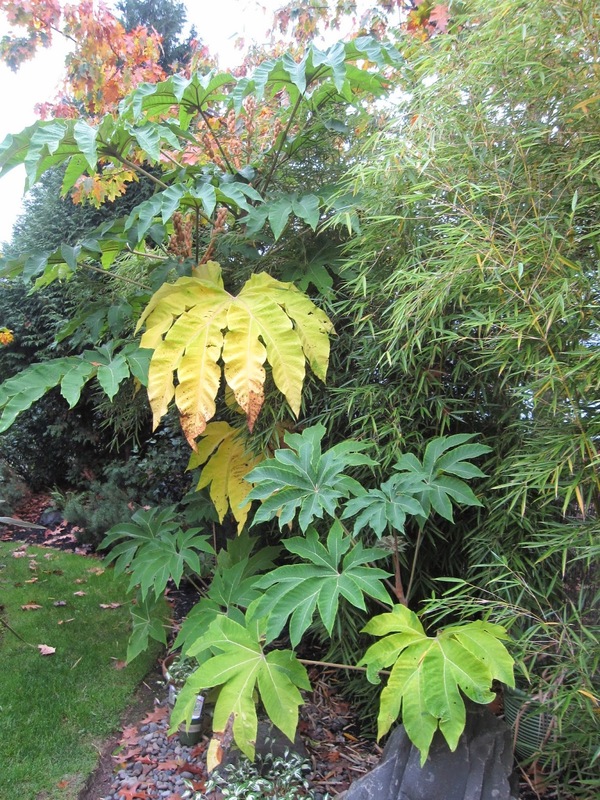 And although the changing color is very short-lived on Tetrapanax papyrifer 'Steroidal Giant', it's just one feature that's making it my favorite this week. You just have to love a leaf this big, bold and buttery yellow! This is my favorite plant of the week for another reason: the annual race is on to see if its blooms will beat our first freeze. I've had this plant in the garden since 2011 and this year for the first time, it produced multiple babies. I've dug and given away most of them, but I like the Tetrapanax forest look so I've left two larger, well-placed youngsters. 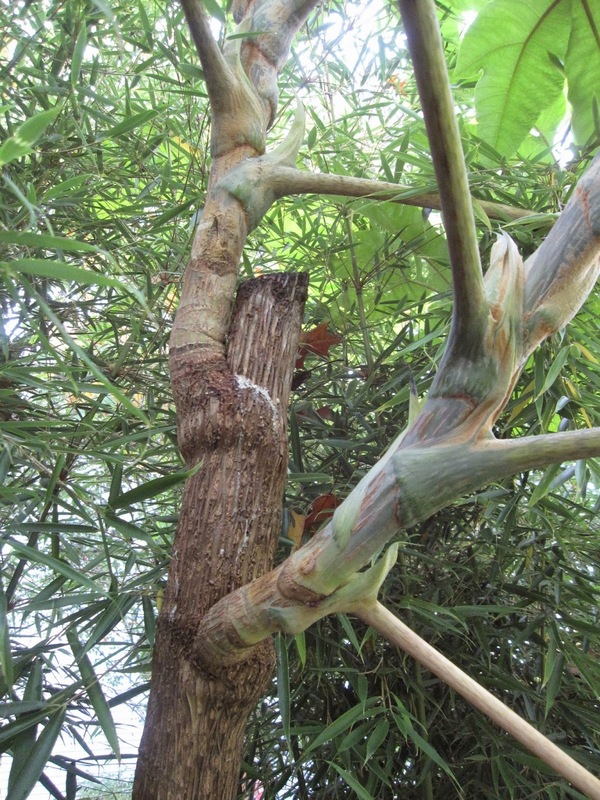 Winter in Portland typically kills off the top of the main plant, so last spring I cut it back at about seven feet to encourage branching out lower down. A final reason this is my favorite plant this week is the perfect view of Tetrapanax papyrifer 'Steroidal Giant' I get from my big breakfast room window. It's quite an eyeful. I'm joining with danger garden to share this favorite plant with you. Click over to read the comments and see what other bloggers are enjoying in their gardens this week.